Our Food Services Department consists of a team of food and nutrition professionals who are dedicated to students' health and well-being and their ability to learn. We support academic success by providing healthy meal choices while promoting lifelong nutrition and fitness practices. 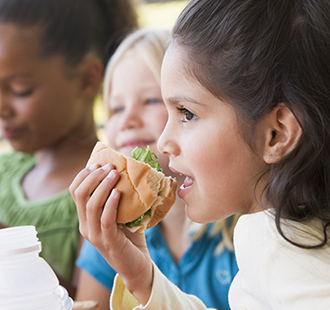 We participate in the National School Lunch Program (NSLP). The NSLP is a federally assisted meal program that provides nutritionally balanced, low cost, or free meals to qualifying students. The food and beverages we sell or serve on our campuses meet the state and federal requirements, which are based on the USDA Dietary Guidelines. We encourage our families to apply for meal benefits by completing a Free and Reduced Meal Application. Did you know that breakfast increases your child’s brain power? Our bodies convert breakfast food into energy for use by our brain. When children skip breakfast, they must rely on the energy from their last meal to fuel their brain. Without breakfast, kids typically have a gap of twelve hours or more between dinner and lunch. This can make kids tired and restless. Our school breakfast ensures your child starts the school day well-nourished and ready to learn. If you believe you qualify for benefits under NSLP, please complete the application below. Participants may qualify at any time during the school year.